As part of a remodel of an abandoned firehouse into a couple's home, the customer wanted 6 walnut-stained birch Dressers with 1 large drawer & 1 adjustable shelf each. Each Dresser was sized differently to fit snugly between door trim in a large "common" room. 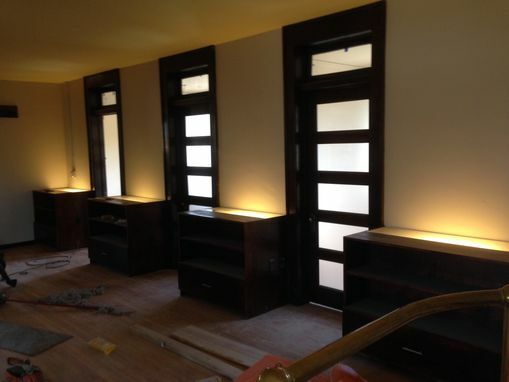 Also as a unique feature, each Dresser was wired for a light fixture on the inside back of each Dresser; the effect is soft, indirect lighting in the large "common" room as shown in the 1st photo. 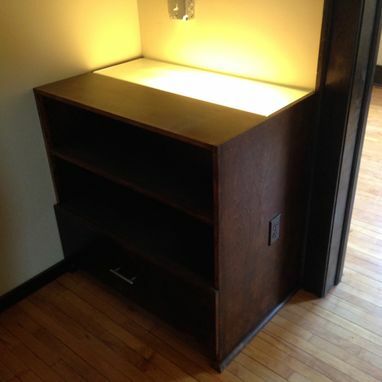 This presented a challenge as the Dressers had to have a false back to hide the lighting fixture & they had to have frosted glass tops over the back half of the Dresser tops to allow the light to come through. The Dressers were stained with a walnut stain that matched the color of the 9 doors with frosted glass panels & given 2 coats of lacquer.